Every stock market changes its direction as per the other market mood. Indian stock market completely reflects the European and American stock exchanges. In the starting session the effect of east Asian countries like Japan and Korea really matters but in the afternoon session the effect of European market start showing its way on Indian stock exchanges. The opening and closing time of every stock market in the world is different and the different time zones make it worst for traders to manage and keep track of opening and closing times of all or most important stock exchanges. The experienced trader knows the importance of the effect of other market index and so he should track the at-least few important markets. Traders clock is a simple tool that will notify the trader about any stock exchange he want to track the opening and closing time. Traders can add any stock market and also can change the opening and closing time of it. It gives the desktop notifications about every opening session of any market selected for notifications. You can also easily find the overlapping timing of the markets making it a great advantage. 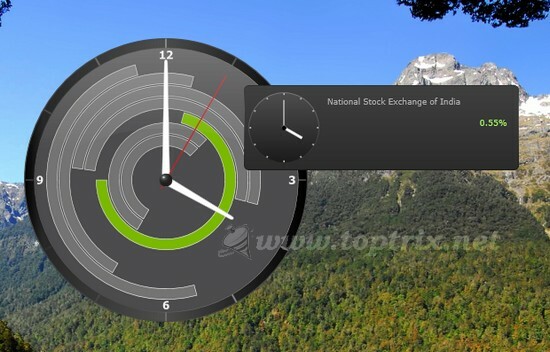 Users can enable or disable the notifications, change the size of clock and add or remove stock exchanges. Is a much helpful tool for every stock market trader. Traders Clock works on Windows OS only. Do you know any other easy way to track the stock market timings? Please share. You can leave a reply if you like the post.